Have you ever wanted to offer a basic certificate for users who pass your quizzes or tests? With this free addon, you can! 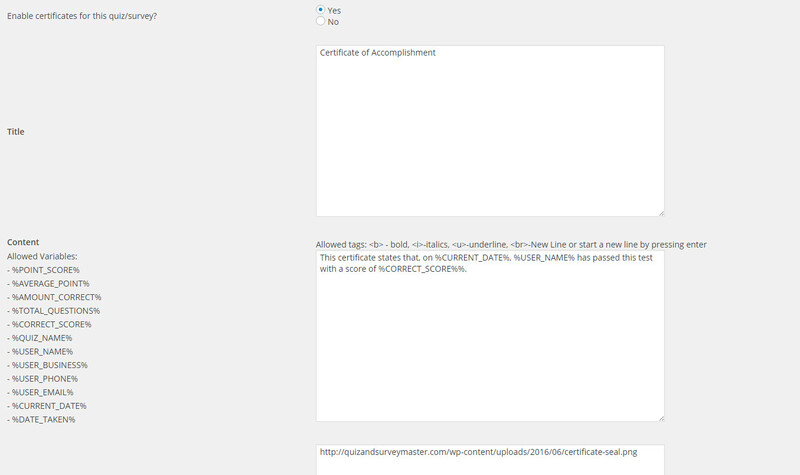 With this addon, you can customize a title of your certificate, its message, a background, and a logo. Submit the example quiz below with a passing score to receive an example certificate created with this addon. What is 2+2=? You must get this right to receive your certificate. This addon will allow you to use a new variable %CERTIFICATE_LINK% to be used in your results pages and in your emails. You can apply some styling to your certificate’s message including underlines, bold, and italics.